Why is it that the word teabag insists on sounding so obscene? Am I twelve? Ah well. There was a thing on Pinterest. Isn't that always the way? This time it was a simple tutorial for turning a t-shirt into a market bag, essentially by sewing up the bottom and cutting out the neck and sleeves. I had a knitting t-shirt that I loved but looked terrible in, and a need for a sweater sized project bag. It was a match made in pinner heaven! 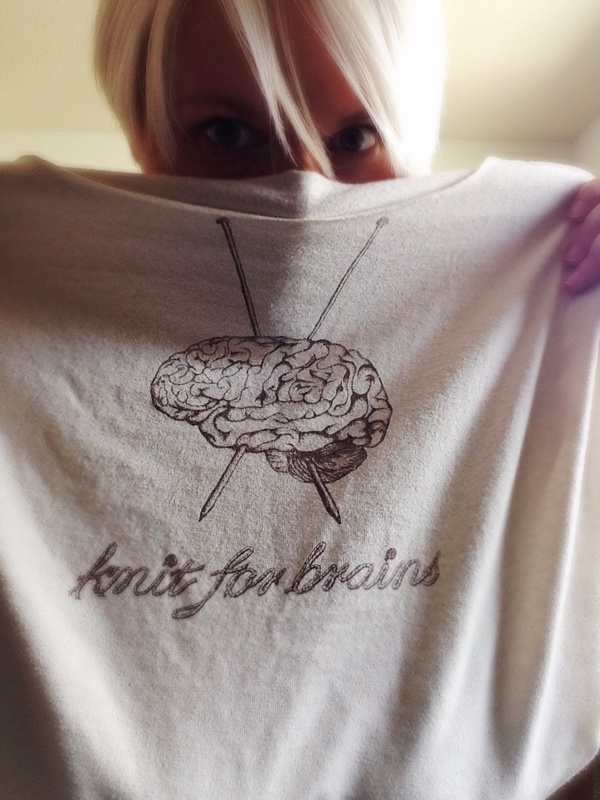 The shirt was from Decor Noir on etsy, and is the best knitting related graphic ever. Now it's my new and improved sweater bag! I wouldn't risk it as a reusable grocery bag (though it would have the virtue of being easily washable) because the handles feel a little weak, but it's perfect for carrying a knitting WIP. If I were doing it again I would have sewn some red piping from my stash into the bottom seam to add structure and cuteness. There you have it! Do you get sucked in by tutorials on Pinterest? Do they work out for you? Do tell.